JOHN M. LANSDEN, of Cairo, Illinois, was born in Sangamon county, February 12, 1836. His parents, Scotch-Irish people, were Rev. Abner Wayne Lansden and Mary Miller Lansden, the former born in Iredell county, North Carolina, October 1, 1794, and the latter in Roane county, Tennessee, February 12, 1809. Her name was Mary M. Gallaher. They were married at her father's home in Roane county, January 29, 1829, but resided in Wilson county, Tennessee, until 1835, when they came to Sangamon county. She died there September 3, 1842, in the thirty-fourth year of her age. Twelve years after her death he married Sarah L. Lowrance, of Jerseyville. They removed to Saline county, Missouri, in 1869, where his two daughters had recently gone. He died there September 8, 1875, in the eighty-first year of his age. John M. Lansden worked on his father's farm fifteen miles southwest of Springfield, and attended the village and district schools, and afterward prepared for college at Virginia, Cass county, Illinois, and in September, 1858, entered the freshman class of Cumberland University, Lebanon, Tennessee. He carried along the first year the work also of the sophomore year, and at the end of the second year entered the junior class in the regular classical course. Prom thence he stood third in mathematics and second in all other studies. Owing to the disturbed condition of the country following the election of Mr. Lincoln to the presidency, he left Lebanon in January, 1861, five months before the time for graduation, and entered the senior class of Illinois College at Jacksonville, and there graduated in June of that year. He taught school for two or three years, and then entered the law school at Albany, New York, where he graduated in the latter part of May, 1865. He obtained his license in that state and upon it he obtained license in Illinois and began the practice of the law in the same year. He became a resident of Cairo in 1866, and from that time up to the present he has continued in the practice of his profession without interruption. He has taken almost no part in politics, although usually acting with the Democratic party. Besides practicing in the state and federal courts of his own state, he has for almost twenty-five years practiced in the state and federal courts of Kentucky and, now and then, elsewhere. 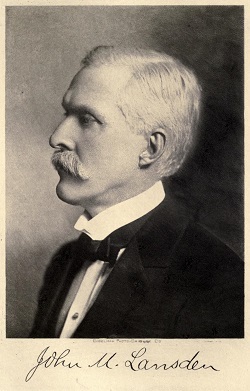 He was admitted to the United States supreme court at Washington in 1896. He was elected city attorney in 1870, and mayor in 1871 and 1872. He has been a member of the following law firms during the many years of his practice: Olney, McKeaig & Lansden, O'Melveny & Lansden, Linegar & Lansden, Mulkey, Linegar & Lansden, Lansden & Leek, and now of the firm of Lansden & Lansden, the junior member of which is his son, David S. Lansden. Recently he wrote a history of the City of Cairo, which was published by R. R. Donnelley & Sons Company, of Chicago, in 1910. In 1867 he married Effie Wyeth Smith, of Jacksonville, a daughter of David A. Smith, a well known and distinguished lawyer of central Illinois. She died January 31, 1907. He and his family have always been identified with the Presbyterian church, as were their ancestors. His father was a minister of the Cumberland Presbyterian church for fifty years. Two of his father's brothers were ministers of the same church, and three of his mother's brothers were ministers of the Presbyterian church. One of them, the Rev. James Gallaher, was chaplain to the House of Representatives at Washington some sixty years ago, and the author, also, of three or four interesting books. Extracted 06 Nov 2018 by Norma Hass from 1912 History of Southern Illinois, Volume 3, pages 1672-1673.